The Brief, Tabloid-Length Life of Pandemonium! Pandemonium! was originally designed by Stephan Michael Sechi, the creator of Talislanta; the core rulebook bills it as being developed by Deja Vu Studios, which Sechi was presenting as being his design studio at the time (following the collapse of his previous company, Bard Games), and it’s supposedly put out by MIB Productions, which I suspect is an only theoretically separate entity from Deja Vu (especially since MIB is listed as being based in Greenwich, CT in the book and what references exist out in the wild to Deja Vu also refer to it as being based there). In practice, though, distribution was handled by Atlas Games – my hunch is that Sechi developed it with an eye to self-publishing, then managed to land the distribution deal with Atlas, making his MIB Productions imprint slightly redundant as a result. The Atlas connection is a natural one; Over the Edge is cited as an inspiration in the bibliography at the back and Pandemonium! exists in a similar high-weirdness setting. It is distinguished from Over the Edge largely by its much lighter take on the high-weirdness concept – rather presenting a vividly realised setting based on the strangest corners of J.G. Ballard and William S. Burroughs’ writing, it’s a wild and wooly take on a world where the wildest excesses of the Weekly World News and similar supermarket tabloids are all real. In keeping with the comedic spin on the game, the system is extremely simple to the point of being near-absent; the main draw here is the range of delicious ideas cribbed from the tabloids that the book offers. As well as a fat chunk of the book being devoted to setting details to use (including, naturally, stats for Elvis), there’s some delicious rules tweaks to emphasise the wacky nature of the world. For instance, the PCs (scuzzy tabloid reporters all) can, if they save enough money, arrange to “fake their death”, so any situation where it looked like their PC died can be retconned so that they survive, and all the PCs have past lives – and if they tap into their past lives they can, temporarily, use the abilities they mastered in those lives. Pandemonium! 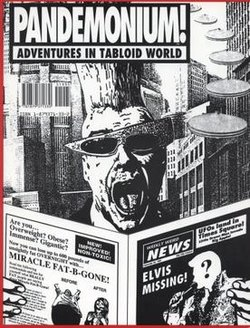 isn’t a game I suspect lends itself to long-term play, and it’s kind of a cultural artifact of the 1980s or early 1990s – the Weekly World News is no more than a website these days and the supermarket tabloids have been poorer for it (and much more sober) as a result. You could respin it as having the PCs working for a Fortean Times-type magazine, though that tends to have a more serious stance than the way the News, which had a fine byline in sly winks to its readers and the like. Still, for a game based around that zeitgeist, Pandemonium! hits the nail on the head and would be pretty entertaining for a one-shot or two. 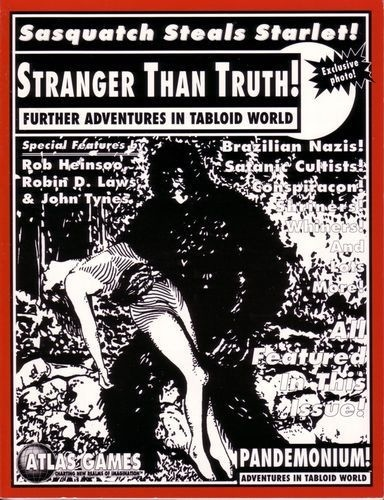 Stranger Than Truth! is the sole supplement for Pandemonium! – a selection of six prewritten adventures for the game penned by various Atlas Games stalwarts. (You get one from Rob Heinsoo, one from John Tynes, and the remaining for from Robin Laws.) They are largely uninspiring, highly-railroaded affairs with little lasting interest in terms of game design innovations – the sort of stuff a reasonably skilled referee could just improvise with the core book – and the overall impression is of a product rush-written to provide a bit of support to Pandemonium! out of the gate. Since no other releases for the game ever happened, I guess it wasn’t that much of a success – and to be honest, Stranger Than Truth! probably didn’t help any.